A whole box full of surprises in a tree! Pandora is notable for its delicate pink blossoms which cover the bare branches in early spring, followed by beautiful bronze-red leaves which change to dark green in the summer. In autumn, the leaves turn a fiery orange. 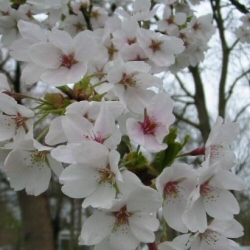 A rambling ornamental cherry perfect for small gardens or one where space is limited. Expect a final height of between 6m (20ft) and 7m (23ft 4in). Pandora is supplied at a height of between 1.5 and 2.00m and in a 7-12L container, which means that the tree can be planted any time of the year and with better results than either bare-root or rootballed trees.